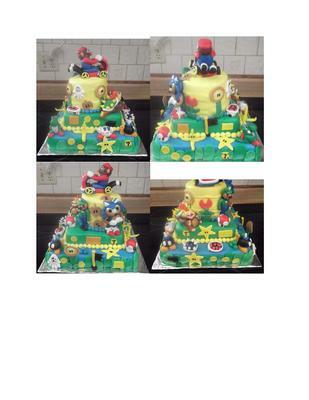 This is my first Mario cake! 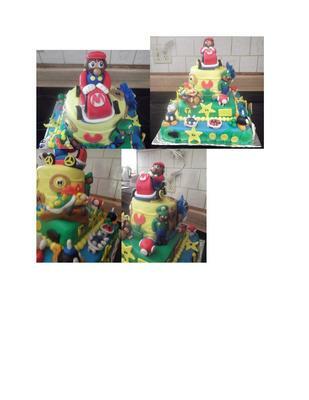 The cake was made for my great grandson who turned 5 in April and wanted a Big Mario cake. As I was making the cake he kept adding characters until there was not more room. The cake turned out great and the kids big and small loved it. This is a three tier square cake with cream cheese icing covered in raspberry fondant. 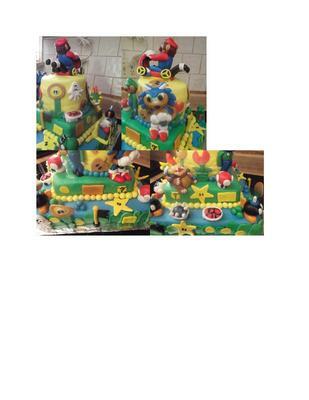 The Mario car is made with rice krispies covered with raspberry fondant as well as the characters. The bottom is two 10” marble cakes, the middle is two 8” yellow cakes and the top is two 6” chocolate cakes. What a great display of talent. The cake shows your love for your 5 year old grandson. I'm sure the look on his face when he saw it was priceless. Continue to use your God given gift. What an amazing cake. This cake has alot of detail on it. The character's on this cake are absolutely amazing. Wow what a lucky 5 year old. Keep up the amazing work. I really enjoy looking at this cake. The details of the characters are unbelieveable. GREAT JOB!!! Your cake is very pretty and it really shows your artistic skills. I am quite sure your grandson and guest enjoyed it allot. Great job!!! Wow! This cake shows great creativity and skill. The creator must love what they do.